Will Grummett left the village of Imam Abas in Mesopotamia, the Norfolk Regiment’s latest resting spot, for Basra shortly after Christmas of 1919. The war was over and although there was an offer to re-enlist and carry on in the region, he chose to go home. Will set off for the port at Basra and the ship that would retrace his journey through the Persian Gulf, into the Arabian Sea, across the Red Sea, through the Suez Canal and across the Mediterranean, and beyond Gibraltar into the Atlantic, and finally to an English Channel port. The journey back to England was markedly better than the trip to India had been those two years ago. The ship was probably as crowded, and, just as on the outbound trip, there would be no chance to get ashore. This time, though, the weather would have been mercifully cooler in December, but, most importantly, there would have been no lurking German U-boats in the Atlantic. I expect Will arrived in England sometime in the latter half of January, 1919. He would have reported to the regimental garrison at Harwich in Essex. His out right release from service or demobilization, was not immediate. The problem was that there were a lot of men to demobilize, and getting them home was a large-scale logistical problem. Canada alone had nearly 270,000 soldiers to bring home with limited shipping. It was also a highly charged situation. Soldiers who had been overseas for years desperately wanted to go home. The wait led to mutinies, and in the case of a Canadian Camp in Wales, to the death of 4 Canadian soldiers. Every one wanted to go home. Will was among them, but he would spend another three months in England. He was officially demobilized on May 8, 1919. On that day his service ended, he received a payment statement and arrears pay in the sum of 144 pounds, 15 shillings and ten pence, but more importantly he was free to go home. His problem now was that he had no official way home. Since he had joined the British Army, the Canadians had no responsibility to ship him home. As far as the British Army was concerned they had shipped him home: to England. I am not certain how he manged to get home, but I would think that he identified himself as a Canadian, explained his situation, and got himself aboard a Canadian troop ship bound for Canada. On the other hand, I like to think that he just might have used some of his hard-earned pay and bought a ticket on a swanky passenger liner and put his feet up all the way home. Before he left England, I am sure Will made a point of seeing Mrs. Le Chavetois and Ida. They were mother and sister to his friend, Grantley Le Chavetois, who he had met during officer training (see post #4). Grantley Le Chavetois was killed in the fighting in Palestine early in 1918. Will had become very close with the immediate and extended family and friends of the Le Chavetois’ during a visit he made to the family’s home in London in 1916. Will remained in touch with Mrs. Le Chavetois for many years following the war, becoming as she put it in a letter, a connection to her lost son. Unfortunately there seem to be no photographs of Will’s time in England and little else to help us piece together his time there before shipping home. Will disembarked from his transatlantic passage at Montreal. As he came off his ship he looked every bit the image of the young British Officer: dress uniform, polished boots, Sam Brown belt, right down to the cane. He spent a night in Montreal intending to catch the train to Toronto next day. He sent a telegram home saying he had arrived in Montreal and would be home in two days, trains permitting. The train ride to Toronto is 340 miles and took the better part of the next day. He stayed in Toronto overnight catching up with old friends. Next morning he boarded the train, leaving Toronto for Owen Sound via Orangeville on what was the old Toronto, Grey and Bruce rail line. His stop along the route was at Proton Station, a flag stop, just north and west of Dundalk. His brother, Ray met him at Proton. After a few cracks about the uniform and the cane, Ray shook his brother’s hand and pulled him in for a hug and a slap on the back saying, “You made it home…” They both tried hard to hold back the tears, Ray busying himself with getting Will’s things into the wagon. Will was looking at the team of horses, idly playing with their halters, running his hand down their warm, muscular necks and murmuring something to them in a quiet voice. Ray finished putting Will’s things in the wagon and hoisted himself into the driver’s seat. “Hey, “your majesty”, can we get going. Mom was fit to explode, and if she does, it’s your damn fault,” Ray said. “Mmhmm, ah sure, but you needn’t refer to me as “Majesty”, “Sir” will do – you rat!” Will replied, jumping up onto the wagon’s passenger seat, giving his brother a shove on the shoulder as he flopped down. They drove along quietly for some time. Will broke the silence, “God it’s beautiful here” he said. Ray looked at his brother, a thousand questions in his mind and evident on his face, but said nothing. They drove on a few more miles to a point just near the beginning of the farm, but well away from the house. “Did you not hear what I said? Let it be on your conscience if you kill our Mother with the wait,” Ray said to Will’s back as he jumped down from the wagon and headed off across the hay field next to the road. Will heard Ray say, “Don’t get those fancy boots dirty…Majesty…” and, chuckling to himself, he drove off toward home. Will seemed to see this place, the only place he’d known as a child and young man, for the first time. It was as heavenly as any of the wonders he had seen in his travels; the sun was warm, and bore no ill will, no hint of its evil twin that had tried short weeks ago to kill him. Everything, the rich black soil, the tall grass, wildflowers and the shade trees all seemed to say, “live”. Will climbed the fence at the end of the hay field and with that he was home. He was now on Grummett land, perhaps the “finest growing land in the country” his father had always said. He paused a moment and looked at the cane in his hand, and then hanging it on the top rail of the fence, he turned, climbed a short rise and there, not far now was the farm house. As he walked down the rise toward the house, he could see his mother sitting on the porch, looking up to the horizon now and then. When she saw him coming toward the house she stood, her hands covering her mouth in a silent prayer, tears filling her eyes. Turning toward the porch, there was his sister Mary standing on the bottom step, “Can this lovely young lady be my ugly little sister Mary all grown up?” and with that he hugged her, the top of her head fitting neatly under his chin. “It’s good to see you Will and your just in time, Mother and I are planning my wedding for just after Christmas.” Mary announced..
“Henry, of course, Henry Lounds.” Mary said proudly. “Do I need to go and have a chat with Mr. Henry Lounds?” Will said feigning suspicion and concern. “Oh Will. No. He’s the most wonderful man in Grey County.” Mary said. Will stayed on the family farm until the start of term in September of 1919, when, as per the original agreement and his desire, he returned to his legal studies at Osgoode Hall. Will graduated from law school after completing an extra session during the summer of 1920 (these sessions were designed to give returning soldiers the opportunity to finish school quickly and get on with their careers). He was called to the Ontario Bar in Toronto in 1921. While working at a Toronto law firm, Will suffered an illness that prompted his doctor to suggest a slower pace of life, and a cooler climate. Oral family history has it that the illness was a recurrence of the malaria he suffered at Belgaum in India, nearly 4 years earlier. I think this is unlikely. If he was subject to recurrence without being re-exposed to malaria by infected mosquitoes, that means he was carrying the disease. If he was, why hadn’t the grueling ten months in combat in the heat triggered the disease?, or, alternately, the extremely difficult 3 months of refugee work? I believe Will suffered the effects of what is now known as post traumatic stress disorder (PTSD). A recurrence of malaria was simply a plausible cover and a simplified way of explaining the very complex and frightening mental and physical ailments he may have been suffering. Our understanding of the effect of violence on the human psyche remains to this day rather poor. It is only in the last 50 years that the real and debilitating mental health effects of traumatic events have been recognized as a disorder, requiring compassionate treatment. Even now, with the disorder identified and treatments available, soldiers are being left to deal with the effects of traumatic stress without adequate medical and psychological support. In 1921, the medical profession hadn’t even begun to grapple with the issue in a serious way (although the documented cases of shell shock and neurasthenia that came out of World War 1 would be the start). There were of course pioneers in the field (see Dr William Rivers, Craiglockhart War Hospital) who recognized the effects as real and significant and not simply a “weakness” or worse, as “cowardice”. On the whole however, lacking even the ability to diagnose let alone treat the trauma, patients were expected to simply “get over it and move on with their lives.” That’s what Will was trying to do, but I doubt he could simply “get over” the memory of the faces, emaciated bodies and staring lifeless eyes of those women, children and old men along that caravan route to Baqubah whose lives he could not save by making trucks appear as if by magic. In his letter of 1923 to the Toronto Globe and Mail he wrote “The death rate per day was very heavy on the 60 miles of route over which I had charge,” he never elaborated further on that unsentimental, factual statement. What more could be said? Will was fortunate in his choice of a compassionate, understanding and insightful physician who, admittedly had little to offer, but offered what turned out be the best prescription. Will could, very easily have gone the route of many who suffered, undiagnosed, in silent self shame, with no apparent options, turning to alcohol or drugs for relief and slowly becoming embittered, withdrawn and often, suicidal. Instead, he tried his best to follow his doctor’s prescription and revised his expectations of himself, and his life plan. I am certain that Will loved Toronto – who wouldn’t have in the 1920’s?- but he left it, and the corporate law firm career he was working on. Instead he chose a change of scenery and the slower pace of life in a northern Ontario town. He chose a place where he could roll up his sleeves and be part of his community as a lawyer and an ordinary citizen, and when necessary, escape to its nearby jack pine and birch forests and bedrock rimmed lakes to recharge his soul. That town worked a kind of magic: the best kind of magic. He found love and he found purpose, and much to his surprise he found himself; whole and strong, and part of something beautiful. This website is dedicated to my Aunt, Mrs. Jackie Seguin, whose unceasing stewardship of her father, William Grummett’s, letters, papers and photographs from World War One made this story possible. Thank you. 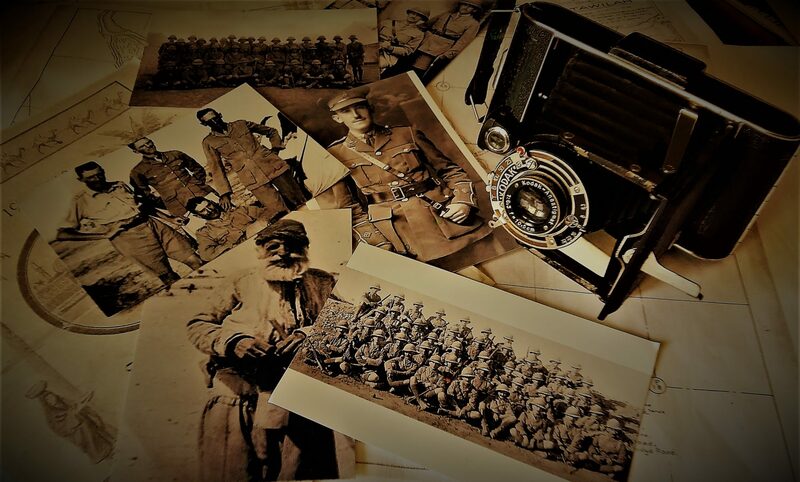 Next postDownloadable pdf of The First World War through the lens of William J. Grummett, 2nd Lieutenant, Norfolk Regiment – Now Available!